On 13 January 1977, Britten-Norman (Bembridge) Limited registered BN-2A series Islander c/n 823 as G-BELF. FBN BN-2A-8 Islander c/n 823 was built in Romania and testflown as G-BELF on 18 August 1977. 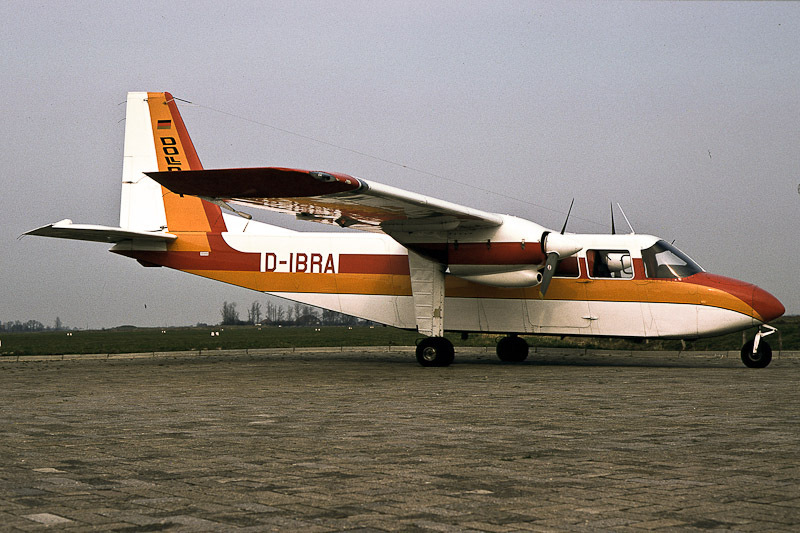 Registration G-BELF was cancelled on 21 December 1977 and the 1977-built aircraft was registered D-IBRA in Germany with Atlas Air Services at Ganderkesee. In 1978, BN-2A-8 Islander D-IBRA was registered with Dollart GmbH & CO. KG. Gesellschaft für Auto- und Flugcharter, Emden. Since 1976, Dollart was operating with OLT (Ostfriesische Luftttransport) and FLN (Frisia Luftverkehr Norddeich) in a joint platform called OFD to ensure a flexible operation, especially in the charter sector in East Frisia. As OLT and FLN, Dollart was active in the Island hopping business connecting the East Frisian Islands with the German mainland. On 16 March 1979, Islander D-IBRA was involved in a near airmiss in the Eelde circuit with Cessna 500 Citation PH-CTG, when the pilot of the Citation saw just in time the Islander was flying just 10 meters below the right side of his plane. In 1987, registration D-IBRA was cancelled and on 8 October 1987, the aircraft was restored to the UK registerer as G-BELF as a Fairey Britten-Norman BN-2A-26 Islander with Atlantic Air Transport Ltd., Baginton. On 27 February 1990, Islander G-BELF was registered with Janes Aviation Ltd., Blackpool. On 18 September 1990, Islander G-BELF was registered with Flying Tigers Ltd., Flying Tigers Skydiving Centre at Goodwood airfield. On 11 February 1992, the aircraft was registered with Activity Aviation Ltd., Perth. On 8 December 1997, Black Knights Parachute Centre Ltd., Preston, was registered as the next owner of Islander G-BELF. On 22 June 2004, FBN BN-2A G-BELF was registered with its present owner, Cormack (Aircraft Services) Ltd., Cumbernauld Airport. Registration G-BELF was changed to G-HEBZ on 21 March 2007.